Pilates exercises are designed to correct and improve separation, sequencing, timing and efficiency of every movement in a mindful, present and controlled matter. 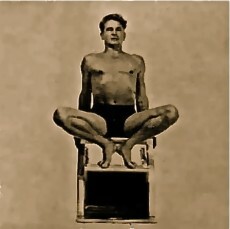 By learning to use the body correctly one will achieve a balanced body that will optimize one’s posture in the process. Pilates is meant to work in conjunction with any other activity or sport and was designed primarily as an exercise system. As such a certain flexibility and strength is required. However a big part of Pilates is the ability to function as physical rehabilitation and is an incredible tool to help with rebuilding after an injury or surgery. Joseph Pilates was a pugilist, a boxer and a diver. He trained the Hamburger Ordnungspolizei (Police) in Germany and was even asked to train the “New” German military, which he declined. The now called Pilates Method, as Mr. Pilates called his exercise regimen “Contrology”, is a very athletic and even acrobatic exercise program that takes heavy cues from Gymnastics, Yoga and Jiu Jitsu , which Mr. Pilates studied as well. One of the main concepts always has been the connection of body, mind and spirit at a very deep level. Later on some of the elders replaced that with the so called “Pilates Principals” to make it more accessible and understandable for the average participant. The principals are breathing, concentration, control, centering, precision and flow of movement. Mr. Pilates’ original program was a mat exercise program comprised of 34 exercises that can be performed in about thirty to forty minutes, however once he realized that he was not always certain whether his clients were fully engaged working on his exercises he went about to invent equipment that uses spring resistance to guarantee, when done properly, that his clients were engaging during his movements and were able to garner the health benefits from his work. The Pilates Method is an exercise program that needs to be done with utmost control and balance, not too fast as to lose the connection from the mind with the body, but vigorous and deliberate. There needs to be an awareness to put all the pieces of the puzzle together in order for our whole body and mind to function in a smooth and efficient way. We need to be able to connect and feel all of our muscles, bones and tendons working together to improve our knowledge of movement, balance, stability, flexibility and strength. I have not found another exercise program that brings all of these different facets together to truly maximize our physical abilities. Whether you just like to stay in great shape or are looking to advance to the next level in your favorite sport on any level, including professional athletes, the Pilates Method will achieve those goals. Pilates is not a miracle exercise system. One does not regain lost length/height, increase muscle mass or bone density mass by just merely attending and showing up to a session. Pilates takes some serious commitment, dedication and hard work to achieve the full benefits that can be obtained if the exercises are done correctly with energy and vigor. Doing Pilates just once a week will not be enough to see results, neither is using the equipment at a lighter weight/tension than prescribed by Joseph Pilates. Of course we have injuries, old ones still lingering or even new ones and we will have to modify some of the exercises and/or the weight/tension for awhile or some time, as long as we know that it is only temporary and we are trying to regain our strength to the prescribed ideal. When people inquire about what I do for a living and I tell them that I am a Pilates instructor I will hear them tell me that they had done Pilates in the past and it was very relaxing…which always makes me wonder what they were doing at the time and why somebody would even consider calling it Pilates. After a proper Pilates work out one should be exhausted, sweating, invigorated, out of breath, tired physically as well as mentally. If I do not feel most or all of these things I know that I did not work hard enough. Studies indicate that up to about age 50 you will lose an estimated 4 To 8% of strength and muscle mass per decade. After that, the loss increases to about 10% per decade and about 2% bone mineral density which means we have to work hard just to keep up with our every ongoing battle to maintain our muscle- and bone density mass. Now if we want to increase both and get into better and stronger shape we have to increase even further our exercise rhythm to get ahead. And no, neither muscle mass or bone density will increase if we push around just a couple of springs on the Reformer during footwork. There is a reason Joseph Pilates used all the springs for these exercises. As a teacher I will make certain that your form will stay close to an ideal as possible, I will continuously queue the client and give reminders of what to feel and look for, I will always define the weight or resistance that one is supposed to use for a specific exercise, but I can not perform the exercise for the client, nor will I really know whether the client is working as hard as they are able. This assessment is the responsibility of the client and must be approached in an honest manner. As long as we can hang on to the form and our breath as close to the ideal as possible and still are able to perform the movement correctly, even if we are struggling a bit, then we are working hard enough. When the last two or three repetitions are a strain and we can barely finish them, then we are working hard enough. Each exercise needs to be done that way. Joseph Pilates kept the repetitions to a bare minimum to get the most out of each exercise. He always proclaimed that each movement was a whole body exercise and that is how we need to treat the complete system. The form needs to be performed as a continuous never ending movement, which of course makes it necessary to also learn and put the same effort forth in the transitions and to melt all exercises into one. It would not be very beneficial if we were to rest after each movement or exercise after having done merely a few reps. The system is designed to be continuous and flowing, never resting and never stopping to deliver a very deep Mind and Body workout that should leave you invigorated and exhausted all at the same time. Then, and only then will you receive and feel the full benefits of Pilates. And that is what I would like to provide and support at aware pilates.